I have been following Erson Religioso, a PT and blogger, for quite some time now. He has repeatedly (no pun intended) discussed the effectiveness of Mechanical Diagnosis & Therapy (The McKenzie Method or MDT). He’s a very knowledgable clinician and runs his social media with integrity. Over the years he has provided a great deal of clinically applicable information and I have seen results in my practice using some of his methods. I decided I had to check out MDT first hand and learn about their method. This past July I took McKenzie Part A – The Lumbar Spine with Dave Oliver. 1) Physical Therapy is a mechanical profession. We should look for mechanical problems. If it’s not a mechanical problem, refer out. 2) Pathoanatomy is for surgeons. It can cause a ton of fear / centralization if we start diagnosing pathoanatomy. 3) MDT is not tissue specific. It is a symptomatic and mechanically driven system. 4) Don’t give up so easy. I used to stop people 3 or 4 reps into their repetitive motion if they had pain. I learned in this class that if it’s a derrangement you need to push through to get a true assessment. Often times the pain doesn’t only go away, but it gets better (green light). 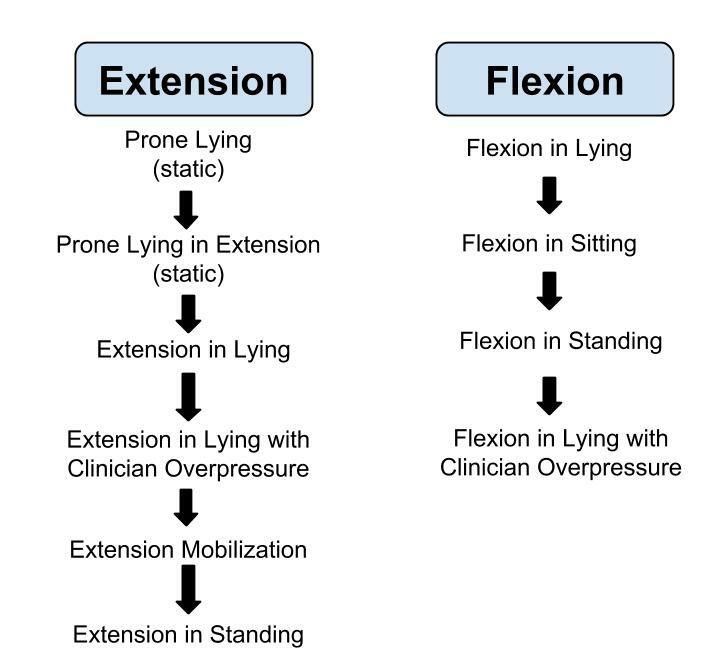 5) Don’t be so afraid of testing flexion. People flex thousands of times a day. If you don’t test it, they’ll test it when they get back into their car after the eval. 7) Chase their mechanical problems using the stop light system. Red light is only if the pain remains after testing. 8) Exhaust the sagittal plane of movement before giving up. Don’t stop at standing repetitive extension. Push through all the way to extension in lying with overpressure before saying it doesn’t work (as long as it’s “stop light” appropriate). See picture below for example of progression. 9) If you’re going to chase symptoms, it’s best to do it through movement (MDT). 10) Plus, if you find a derangement you can resolve their symptoms immediately and then start working on their movement dysfunction (SFMA). 14) Finding someone with a derangement makes your job ALOT easier. You can then use repeated motion to clear their pain. Since using this system the past few months, patients are amazed by how quickly their pain resolves. 15) End-range extension in lying is when you lock out the elbows, exhale, and let the lumbar spine/pelvis relax (Lock, Blow, & Sag). 16) Resolving a MDT dysfunction will be uncomfortable. You have to remodel tissue. It takes time. 19) It’s NOT an extension-based system! 20) It’s a end-range, repetitive motion system. 21) End-range is extremely important. Make sure you get there. Extension & Flexion Progressions. Don’t give up half way. Overall it was a great course and I’m glad to have a better handle on the MDT system. I think it is a great system to use for any patients with pain. People come into the clinic because they’re in pain, not because they have a movement dysfunction. Clearing out their pain is their #1 priority, therefore, it’s your #1 priority too. Plus, preventing acute pain from becoming chronic is one of the most important aspects of physical therapy. The only problem I have with MDT is their lack/disbelief of stability. An example of this problem was evident during one of the live case studies. A woman came in with back pain. She had excessive motion in every direction (and probably a positive beighton laxity test). Repeatitive motion exercises only made her worse. Over the 3 days both directions were tried, and both increased her pain. She was getting worse. Without a stability approach what would happen with the rest of her plan of care if you were only using the MDT system? That’s not to say it didn’t work with the other 5 live case studies. In fact, besides the hypermobile woman, all 5 patients had a significant decreases in pain after 3 days. And 3 out of 5 of them were flexion based! Hi Aaron, just came across your site while searching for resources to use when teaching Applied Biomechanics to DPT students in the upcoming semester. Thanks for this great summary post. The only comment I would add is that MDT as a system doesn’t refute “stability” as a relevant component of our practice… it just isn’t part of the derangement / dysfunction / postural syndrome mechanical classifications. The case you described would be classified as “other” and would lead the clinician to explore other interventions in his / her professional repertoire (which, to me, would probably include core stabilization techniques). I would still consider MDT effective as an evaluation system when it leads you to a mechanically-informed decision that the patient will not benefit from repeated or sustained end-range loading strategy. Thank you for your response Alison. I was unaware of the “other” classification; it was not taught in the course I attended. And I agree, MDT is an effective system. Since taking Part A I have incorporated it into my practice with a lot of success. I’m looking forward to taking more MDT classes in the future.